I have neglected you, 'tis true. I haven't felt much like sewing these days. I found for me my interest in sewing goes in spurts. I am currently working on getting myself in shape which is a long road but I'm committed! Anyway, I have an issue with some garments and I was wondering if anyone knows what the deal is with this. I have purchased a number of authentic 1920s dresses since I started this blog. Two of those dresses have ridiculously small arms holes. Like I can't even get my arm into them! I don't get this. I don't have walrus like arms and the rest of the dress fits my measurements. 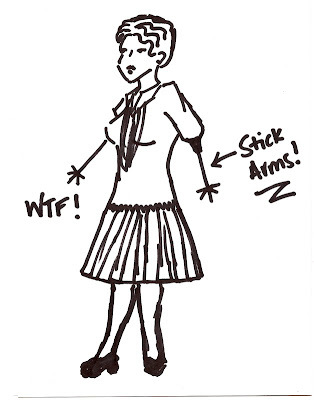 So I honestly wonder...did women (even those with curves) have stick arms? Drawing is copyright ME so don't try to steal this priceless treasure and call it your own! Anyway, this isn't meant to be a joke entirely because this is really baffling! I mean the above is really what I picture in my head! You know as well as I do that they were just smaller in stature due to a lot of factors...I have the same problem too. Damned wee little tiny girl-people of the past! But the other measurements match mine! I do not own any dresses from the 1920s but I have heard so many girls mention the fact that the arm holes are so high and so small! Before 1950 any clothing that was meant to be worn in public always had high and tight armholes. It actually had to do with looking neat and proper, as only pyjamas had loose armholes. So it might not be that the vintage sleeves are tight per se, but more that they are tighter than we're used to nowadays.